Very clean, great location, trams right out the front. Enjoyed the $5 breakfast-very convenient! Will definately stay again. The accommodation was suitable for our stay overnight. Although I could not pick up the wi-fi as the signal was not strong enough. And other children staying at your property were a bit of a nuisance, but overall we will be back. grate place to stay, and close to transport. Very good, close to every thing. Staff were excellent, very helpful. We had a very good stay and more importantly we were close to city. Cord on microwave was frayed and so was iron. My towels and teatowels were changed every day which I thought was excessive- I would have been happy if they were not changed at all during the time I was there. It was excellent - we would certainly come again. 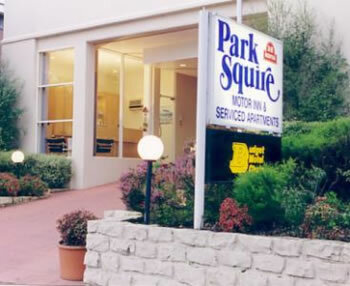 THIS WAS OUR 4TH OR 5TH STAY AT THE Park Squire. WE LIKE IT DUE TO ITS LOCATION AND EASE OF GETTING TO AND FROM FOR US, AS WELL AS THE NEARBY TRAM STOPS AS MOST OF OUR TIME IN Melbourne IS SPENT IN THE CITY. THE ONLY PROBLEM THIS TIME WAS WE BOOKED FOR 3 ADULTS IN AN APARTMENT AND WE ONLY GOT 2 BEDS, SO MY SON AND MYSELF HAD TO SHARE A DOUBLE BED, WHICH WASN'T THAT MUCH OF AN ISSUE. I THINK I MIGHT HAVE BOOKED THE SMALLER APARTMENT INSTEAD OF THE LARGER FAMILY APARTMENT BY MISTAKE, SO THAT IS NOT THE Park SquireS FAULT. ALSO, WHEN WE CHECKED INTO THE ROOM, THERE WERE NOT ENOUGH TOWELS FOR 3 PEOPLE IN THE BATHROOM. HOWEVER, THIS WAS QUICKLY FIXED BY A VISIT TO RECEPTION WHO WERE HAPPY TO GIVE US A COUPLE OF MORE TOWELS. AN IMPROVEMENT FOR US WOULD HAVE BEEN ABLE TO HAVE 2 SETS OF KEYS AS WE WERE COMING HOME AT SEPERATE TIMES ONE NIGHT, WHICH ENTAILED SOMEONE HAVING TO GET OUT OF BED TO LET PEOPLE IN THE SECURITY GATES. MAYBE AN UPGRADE TO SWIPE CARDS? OVERALL, VERY HAPPY WITH THE Park Squire AND WILL BE STAYING AGAIN IN THE FUTURE, AS WELL AS CONTINUING TO RECOMEND TO OUR FRIENDS.